Russian TV has been ratcheting up its belligerent rhetoric as fears grow of a full-blown military conflict with its neighbour Ukraine. But Ukrainian media has been hitting back at what one leading politician called Moscow's "information offensive". Official Russian TV channel Rossiya 1 has given strong indications that further military action will follow after Moscow strengthened its armed forces' presence in Crimea and Russia's upper house of parliament unanimously voted to endorse Vladimir Putin's use of troops in Ukraine. 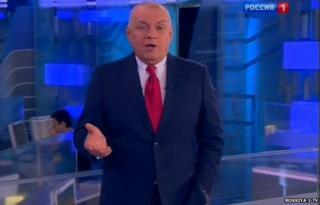 In a special edition of its flagship current affairs programme Vesti Nedeli (News of the Week) on 2 March, controversial anchor Dmitry Kiselev was dismissive of Western threats of diplomatic isolation for Russia and of the new Ukrainian government's decision to order the mobilization of its armed forces. "I don't want to offend anyone, but the best that can be said for the Ukrainian army is that there isn't one," Kiselev sneered. "We don't give up our own"
Mr Kiselev is well-known for his anti-Western and homophobic diatribes, as well as his extremely hostile attitude to the protests in Kiev that led to the ousting of President Viktor Yanukovych. The UK magazine The Economist has dubbed him "Russia's chief propagandist". Denouncing the "bandit excesses" that had brought "democracy to its knees" in Ukraine (language that has now become familiar in Russian TV's coverage of the crisis), Mr Kiselev insisted that Russia had to defend its "interests" and the Russian-speaking population there. Framed against the background of massed Russian flags at a pro-Moscow demonstration in Crimea and the caption "We don't give up our own", Mr Kiselev said that it was "impossible not to respond to this challenge". But Russian TV has been studiously ignoring Moscow's military presence in Crimea, focusing instead on self-defence units, which, it says, are protecting the local inhabitants against "neo-Nazis" in Kiev. Meanwhile, reports from the eastern Ukrainian cities of Donetsk and Kharkiv have shown crowds chanting "Russia, Russia", waving Russian flags and sporting the ribbons of St George, a military symbol associated with Russia's annual Victory Day celebrations on 9 May. "This is a personal matter for all of us. It is an historic moment, when our common energy is the key to victory," Mr Kiselev intoned. Rossiya 1 has further sought to cast doubt on the legitimacy of the current Ukrainian government by suggesting that Yanukovych's overthrow was engineered with the help of "mercenaries" from the USA, UK, Germany and Turkey. It has also played up reports of links between Ukrainian nationalist "radicals" and anti-Moscow Islamists in the North Caucasus. And Russian TV has been running other stories that could be used to justify further military intervention in Ukraine, both to its own citizens and world opinion. The Vesti Nedeli special on 2 March suggested that "unknown armed people" had crossed from Ukraine into Russia's Belgorod Region. Earlier, state-controlled Channel One TV reported that over 140,000 people had fled to Russia to avoid the unrest in Ukraine. But as many observers have pointed out, Channel One illustrated the story with shots of a checkpoint at a border crossing between Ukraine and Poland. Some of these reports are reminiscent of Russian TV's claims that some 2,000 people had been killed in a "genocide" unleashed by Georgian troops at the start of the 2008 Russia-Georgia war. Russia later admitted that only around 160 civilians had been killed in the conflict. Independent media in Russia have questioned both state TV's coverage of the Ukraine crisis and Moscow's involvement in it. Business daily Vedomosti noted the susceptibility of Russian people to "TV propaganda" and the idea of empire, but said that the "behind the imperial propaganda there is no politics, economics or desire to support an empire". And an article in opposition paper Novaya Gazeta said that if Russia continued to occupy Crimea, it risked both becoming a "rogue state" and being saddled with a multi-billion-dollar bill to support the region. Some leading Russian bloggers have expressed "shame" and disquiet about Russia's actions on Ukraine. But there is also evidence of a pro-Kremlin online mobilization. The Russian hashtag "RussiaDoesn'tAbandonItsOwn" has massed over 80,000 tweets. Much debate in the Ukrainian media has focused on ways of countering what former boxer and UDAR party leader Vitaly Klitschko has called Russia's "information offensive" against his country. Some politicians have renewed calls for cable companies to drop Russian TV channels, which are widely watched, especially in the east of Ukraine and Crimea. Journalists have set up a website called StopFake.org to counter what they say is the "extremely dangerous dissemination of false information about the events in Ukraine as a whole and Crimea in particular". Independent Hromadske TV has also been trying to counter some of the messages coming out of the Russian media. For example, it featured a Russian journalist saying that there was no truth to Moscow's allegations that Russian citizens and Russian-speakers in Crimea had been mistreated or were under threat. It has also reported claims that Ukrainian journalists were being denied access to Crimea to prevent them from telling the truth about what is happening there. Originally an internet-only station, Hromadske TV quickly emerged as one of the key sources for anti-government protests in Kiev. Since Mr Yanukovych's overthrow and flight to Russia, its programmes have also been carried by a number of terrestrial channels, including state-owned UT1 and Kanal 5, owned by the pro-Western businessman Petro Poroshenko. UT1 and Kanal 5 were among a number of TV channels that carried rolling news and current affairs coverage on 2 March to reflect the deepening crisis in the country. At midnight, Kanal 5 pondered the day's events in tones of calm seriousness, very much at odds with the highly-charged rhetoric coming out of Russian TV. The presenter said that the Orthodox holy day of Forgiveness Sunday had come and gone, "but still we have seen no apologies from the fraternal people [of Russia] for the aggression". Ukrainian press and online media have featured messages of hope, resignation, but also sombre defiance. In an article posted on the Glavcom website, former Ukrainian President Leonid Kravchuk said that if Russia continued on its path to aggression it would meet stiff resistance. "I am 80 years of age, but I will take up arms and defend my country. Every citizen will defend his territory as though it was his own home," Mr Kravchuk said.